Structural, Mechanical and electrical engineering services for a 7,500 sq. ft. addition and a 17,850 sq. ft. renovation of an existing church. 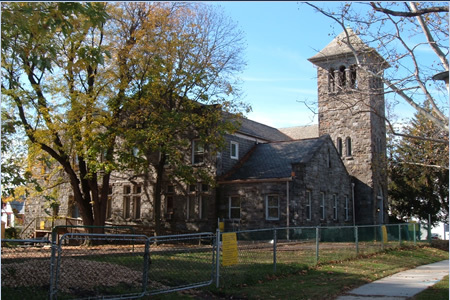 The areas of the building included a large activity/multi-purpose room, youth room, classrooms, infant room, music room, chapel assembly, library, restrooms, offices and computer rooms. The new HVAC system consisted of a gas fired roof top unit serving the 3-story addition which included six classrooms. Each classroom is served by a modulating damper located in the supply ductwork which is controlled by its respective wall mounted thermostat. A main bypass damper between the main supply and return ductwork directs the conditioned supply air to the main return ductwork as required. The new HVAC equipment for the renovated areas on the first floor consisted of a gas fired roof top air conditioning unit which was ducted to the ceiling space of the first floor and to fifteen duct mounted zone dampers. Each zone damper was selected for the area with similar comfort conditioning requirements. A split air conditioning unit with a vertical floor mounted indoor air handling unit and roof mounted condensing unit was selected for the activity room, fellowship hall, classroom and kitchen in the basement. A gas fired hot water boiler supplied the heating water to the heating coil of the air handling unit. Prefabricated round insulated exposed ductwork was used throughout the basement area. Plumbing design consisted of selection of pluming fixtures and domestic water heater. The sanitary, vent, domestic cold and hot water piping and related riser diagrams were shown for all pluming fixtures. Coordinated with various agencies and firms such as the local gas, electric and water companies and the civil engineer concerning incoming utilities. Electrical engineering included survey of the existing power distribution system and sizing of the new electrical service. Provided a new 600 amp distribution panel and related power distribution to various equipment including several roof top units, elevator, heaters, motor loads and various kitchen loads. Designed the lighting, power, communication, data, and new fire alarm system for the building and performed lighting calculations for addition and renovation areas.